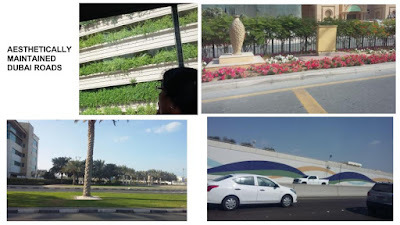 Our drive from Sharjah to Dubai was awesome - good roads, fantastic constructions, even cool greenery in the desert place. Dubai is popularly believed to be a state of Malls and skyscrapers. 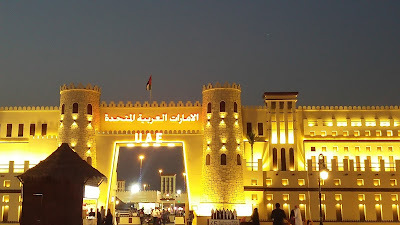 This emirate of the UAE promotes tourism in a big way, so many flock to Dubai. 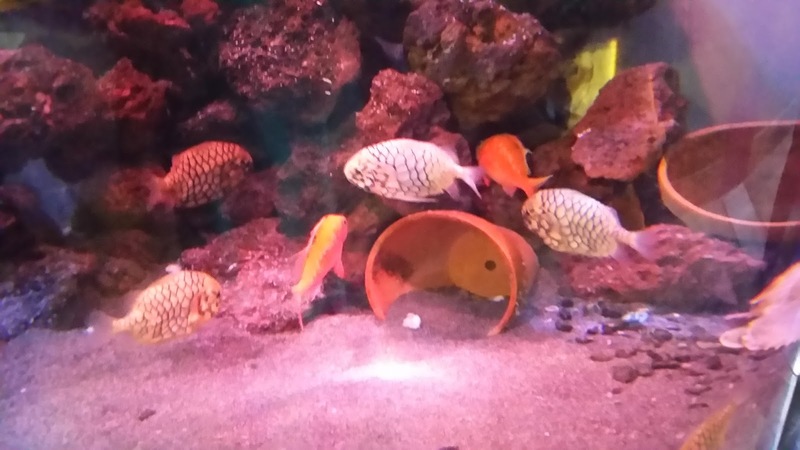 What does this desert place have to showcase? Plenty. 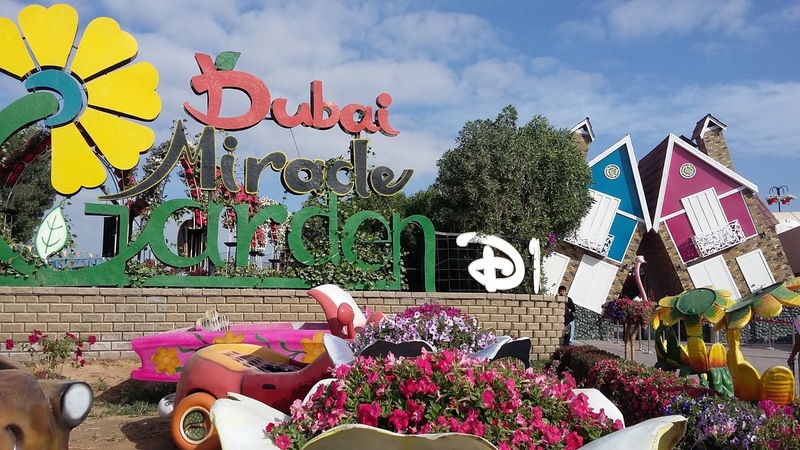 As if that is not enough, if you grab the right season weather-wise and otherwise (Nov - April), delicious Dubai comes with extra toppings - Dubai Shopping Festival (DSF), Global Village and Dubai Miracle Garden. - some twin towers - The Emirates Twin Towers and of course the 'Petronas Towers/Chrysler-building-lookalike' the Dubai Business Central Twin Towers. Then there is the uniquely shaped Etisalat building - the "golf ball" towers, illuminated with a mesh of discrete white lights at night. 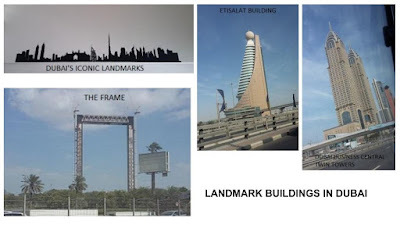 And the 'Frame' which is proposed to frame the emblems of the city by building a void of 150 meters by 105 meters to continuously frame the development of the past, current and future Dubai. Dubai's famed landmark, the Burj Khalifa is the world's tallest building. Its height is 828 metres. 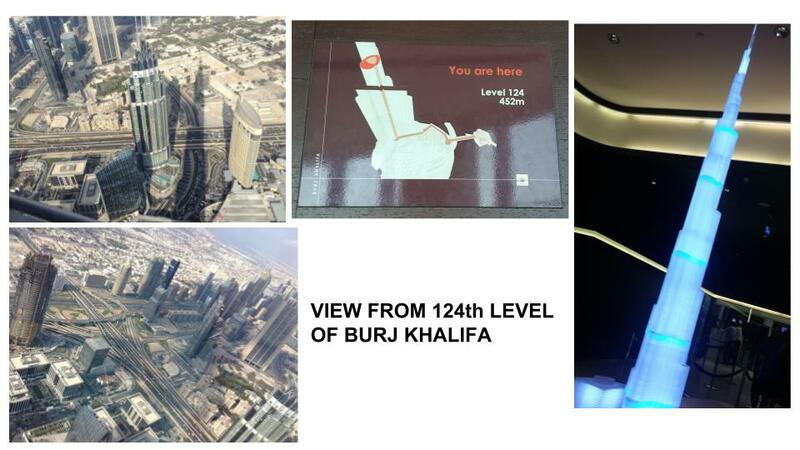 You can go to the 124th level and have a fabulous bird's eye view of Dubai. How long does the elevator take to reach the 124th floor? Exactly ONE minute. 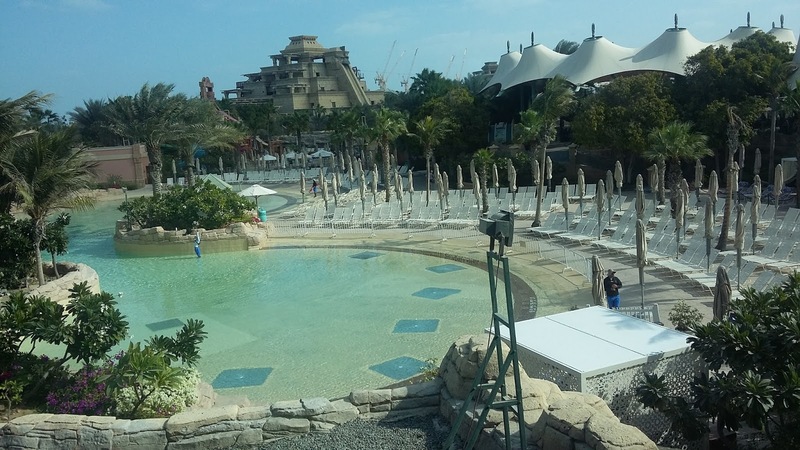 Another delight is the artificial island Palm Jumeirah and the renowned sprawling Atlantis Hotel located at the apex. It was the first resort to be built on the island and opened in 2008. Palm Islands are three artificial islands, Palm Jumeirah, Deira Island and Palm Jebel Ali, on the coast of Dubai. Only Palm Jumeirah has been completed. This island takes the form of a palm tree, topped by a crescent. 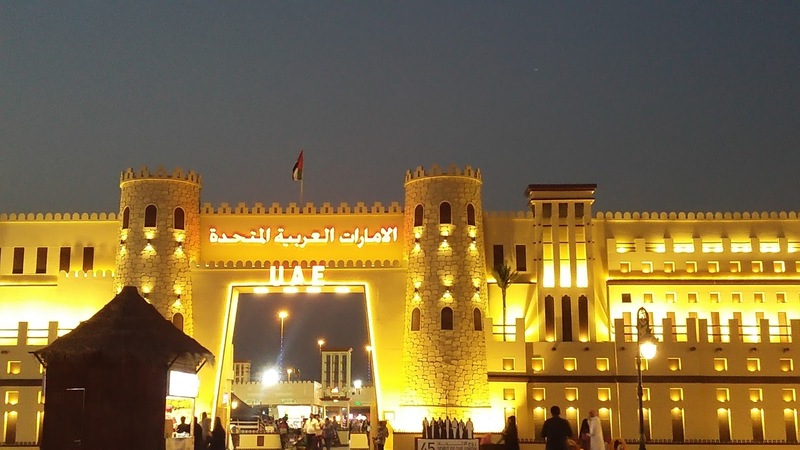 It hosts a large number of residential, leisure and entertainment centers with a large area of non-public beaches added to the city of Dubai. An address in The Palm is a prestigious status symbol and every Richie Rich in the world owns prime property there. 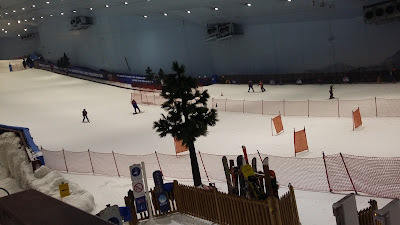 As we take the ride in the mono rail, we get an impressive arial view of the place - with different sets of identical buildings beautifully maintained on every 'branch' of the Palm. The Atlantis Aquaventure looks inviting - unfortunately it is not in our itinerary. Jumeirah Beach is a visual delight. It welcomes visitors with its spotlessly clean carpet of soft, off-white, fine-semolina-like sand kissed by the bluish green waves topped with bubbly white foam . 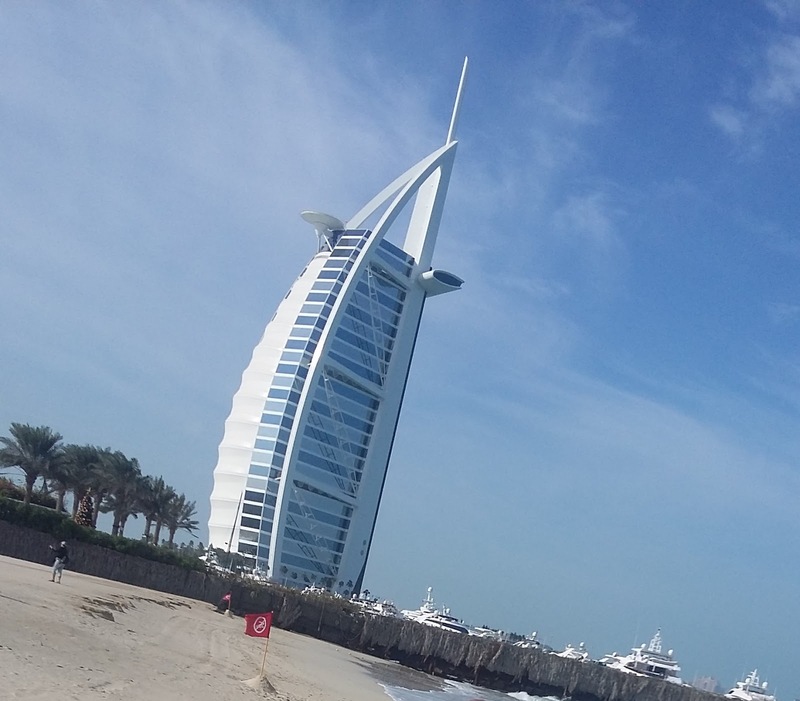 As if this isn't enough, we see the iconic Burj Al Arab bang on the sea shore - in all its glory in its sail-boat shape. It has a helipad near the roof at a height of 210 m above ground. The most luxurious hotel in the world, it is rumored to be the only 7 star hotel, though the management make no such claims. 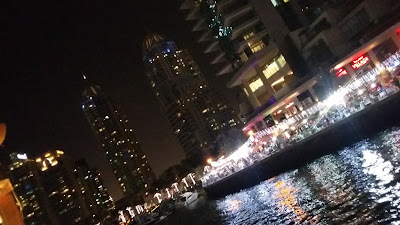 And if this is not enough, there's the fantastic Jumeirah Beach Hotel standing majestically close to it. Then there is the 'Dhow Cruise Dinner'. 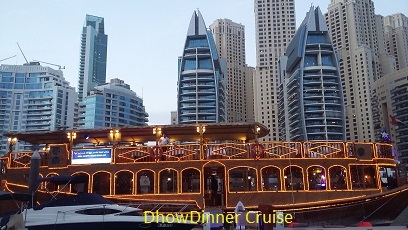 'Dhow' is a modest boat of olden times taking you on a two-hour dinner cruise as you catch glittering glimpses of the exotic buildings gracing the shore. 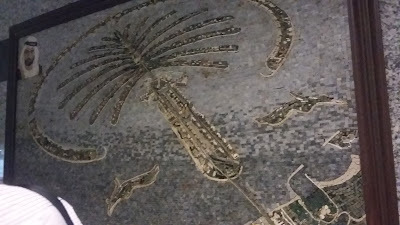 That's Dubai for you - as one of our guides enlightens us - the Sheikhs of UAE love to not only remember but also remind the people about their modest past even in their glittering present. 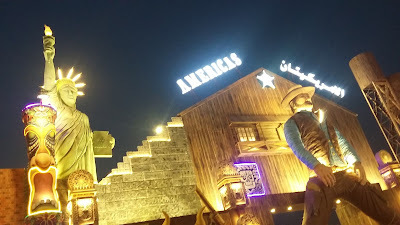 Our visit to Dubai Museum also reiterates this fact as we are transported to olden times through the exhibits - we can get to see rooms with thatched roofs and matted walls to maintain a coolness in the summer. The present of course is a far cry from those times. But even now there are two-storeyed houses with 'barjil' which provides a sort of natural air-conditioning with large openings on opposite walls on the terrace of the houses to allow cross-ventilation. People love to sleep there enjoying the breeze during benign seasons. 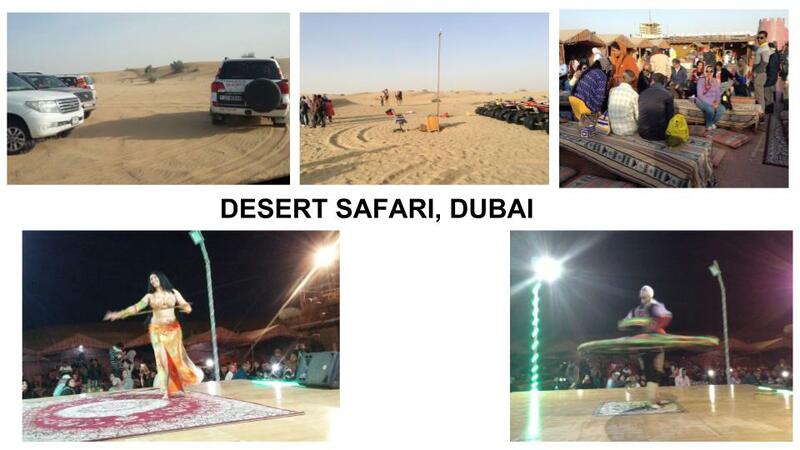 How can a visit to Dubai be complete without the Desert Safari? We undertake the evening safari. 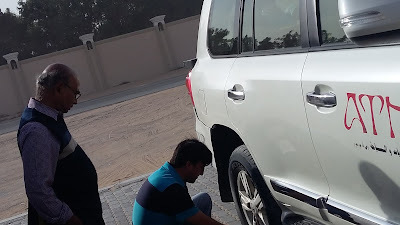 We start from our hotel around 3.30 in batches of 6 in 4x4 Land Cruisers. After a drive of about 40 minutes through a variety of terrain, we are close to the desert. All the land cruisers are lined up at a shopping area for half an hour where visitors can shop or have some refreshment. 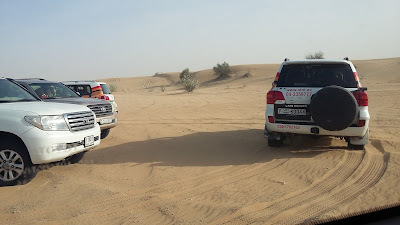 Our drivers prepare for the desert safari / dune bashing by reducing the air of the tyres to the desired level to enable the bumpy drive through the sand dunes. 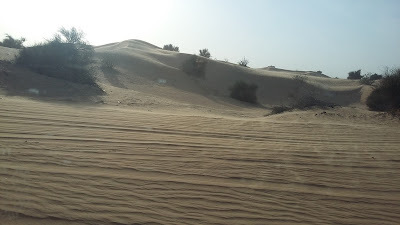 Then starts the thrilling dune bashing. All of us sit tight, belted to our seats as anticipation and excitement run high - not without a trace of nervousness. Thankfully we are not in the leading car. 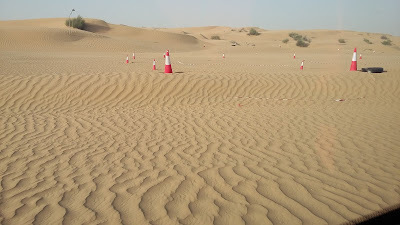 All others follow the leader around the sand dunes - there are no roads as such. So you can imagine our spine-tingling and bone-rattling experience as our vehicle jumps and jerks as it speeds on the soft desert dunes. I have the audacity to turn on my camera to shoot glimpses of the movements in the car even as I clutch on to dear life and yell during the roller-coaster drive. All said and done, I have to admit I would not have missed this unique experience. In about half an hour, visitors are taken to the Special Bedouin tents where they can relax, enjoy camel ride, henna painting, drinks (sheesha / cold drinks / tea / coffee) and much more, all complementary. You might think we would have been roasted in the desert. No - far from that. Being the month of January, it is windy and cold in the desert. And we are well-equipped because we have all come armed with jackets, caps and gloves and scarves as per instructions. 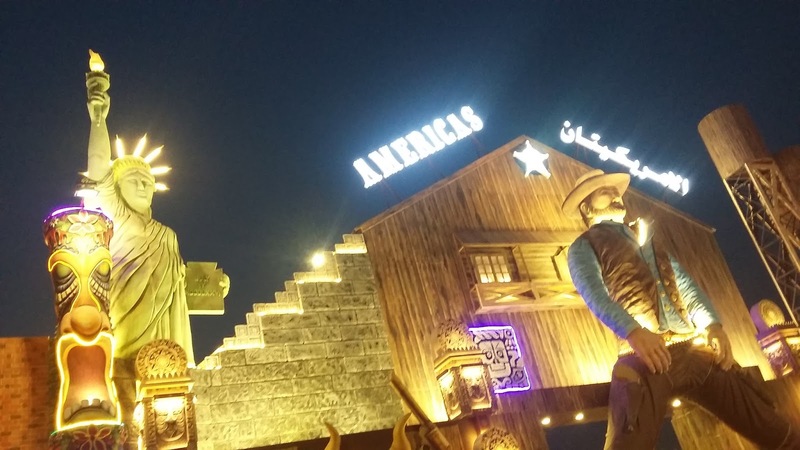 We also enjoy starters and then dinner including BBQ while enjoying Belly Dance, Fire Dance and Tanoura dance. Tanoura means skirt in English. Tanoura dance is a form of folkloric dance of Egypt usually performed to Sufi music by Sufi men, who while depicting their skill at juggling and balancing, spin continuously without even feeling dizzy at the end of it. It reaches a crescendo at the climax with colored bulbs in the skirt whirling at different angles! 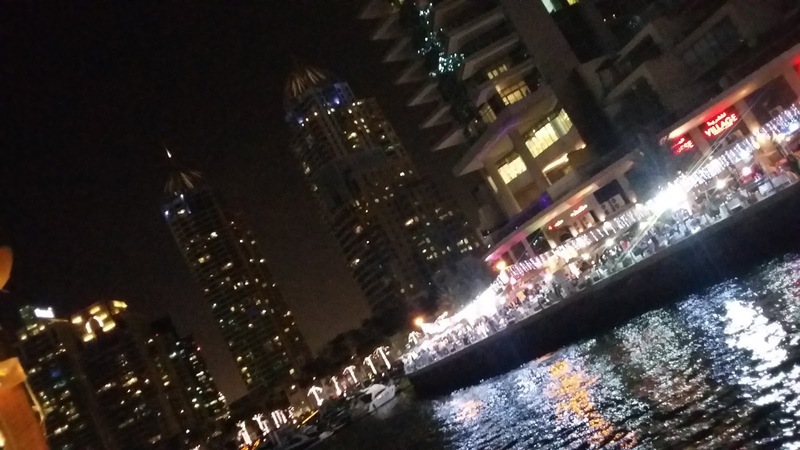 The fun lasts till night and then clients dropped back to their places with treasured memories. You also have incongruous attractions such as Ski Dubai, an indoor man-made ski place, a sprawling 'ice land' created in the Mall of Emirates with tons of ice. indulge in tubing or enjoy the cable car ride (Chairlift). Not to worry about the required gear for this cold place - your ticket entitles you to a suitable jacket, gloves, socks and shoes provided by them. 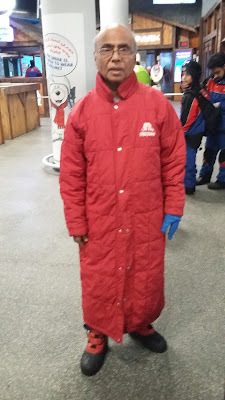 When you exit, you have to return only the jacket and shoes, the rest can be retained as memorabilia. We also visited Dubai Mall and the Underwater Zoo located there. 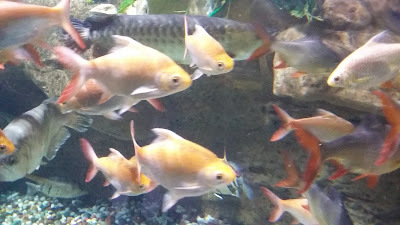 The variety of fishes in various sizes and colors and all sorts of underwater creatures were a feast to the eyes. 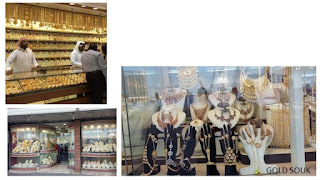 Dubai, the Gold City dazzles its visitors with scores of jewelry shops choc-a-bloc with multifarious blinding chunky gold ornaments. Few can resist the temptation of buying at least one 'tiny item' if not one for each member of the family from one of the numerous shops in the Gold Souk. 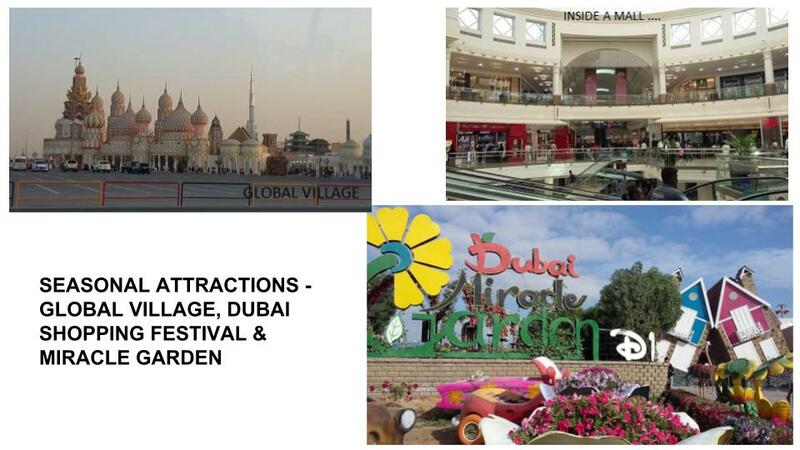 Dubai offers all these attractions all through the year. 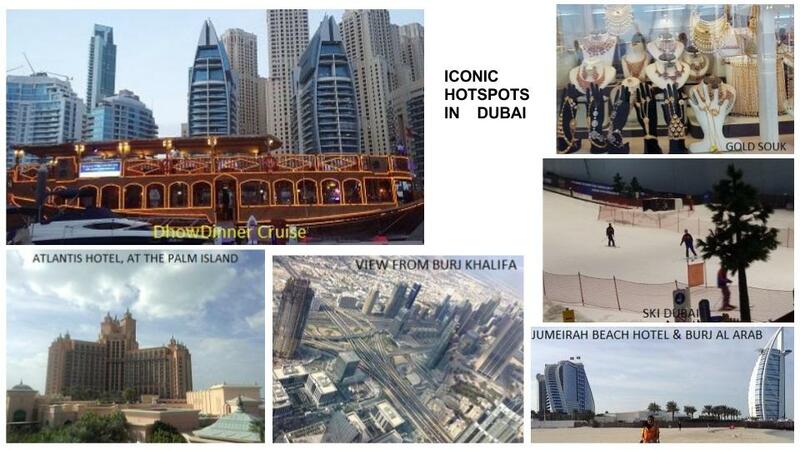 What are the special attractions for tourists during Nov - April? 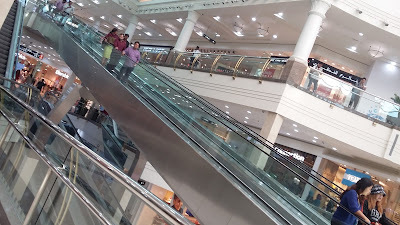 All the malls - be it the Mall of Emirates or Dubai Mall or Deira City Centre - have great discounts and offers galore - enough to make a compulsive shopper shop till she drops! Popular brands are available at their retail outlets. But Chinese goods also dominate the scene - obviously discerning customers spend a lot of time selecting the best buys. 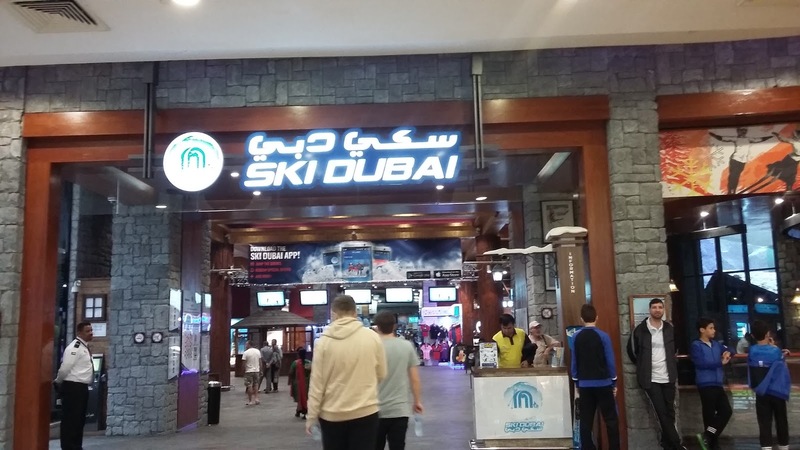 'Carre Four', the 'Big Bazaar' of Dubai is a one-stop-shop for everything under the sun and is a favorite haunt of tourists and middle class locals. 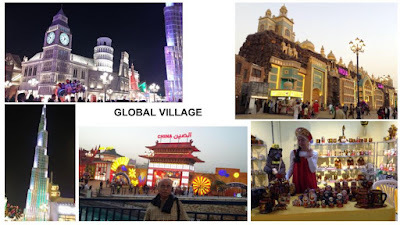 Global Village is claimed to be the world's largest tourism and entertainment project, also the region's first cultural, entertainment, family and shopping destination. 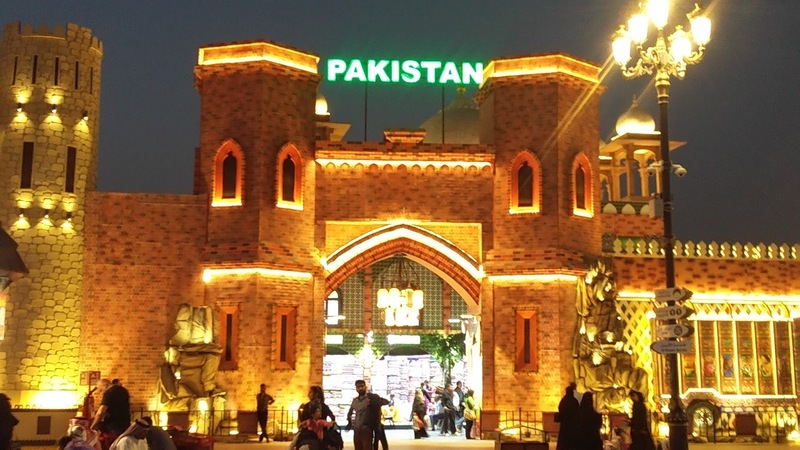 The open air exhibition with stalls of most of the countries of the world is an irresistible treat. The gates are open from 4 pm to midnight. 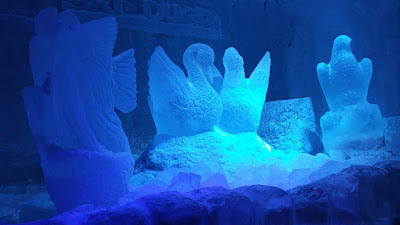 After sunset, the sprawling place is aglitter with colorful lights. The grand pavilions beckon the visitors with their awesome facade. If you take a stroll inside, you get a glimpse of the tradition, culture and amazing goods special to that country. If you have a list ready - like a carpet from Iran, crockery from Russia, honey from Yemen, oriental home-decor products from Tunisia or Egypt ... you are set - you just have to get in at the chosen pavilion and make your purchases. But for those tourists who are 'list-less', it is a mad hop-skip-n-run, clicking photos for their album at every stall and taking a quick walk inside some selected stalls. It is worth spending some six hours there - if you have the time and stamina that is! And definitely you'll be left craving for more! If Global Village can be described as awesome, I'll have to find a better epithet to describe the largest garden in the world - the Miracle Garden which is open from October to May. birds, stars, igloos and so on. Inviting a million visitors annually, floral displays change each season so that repeat visitors will have a new experience each time. 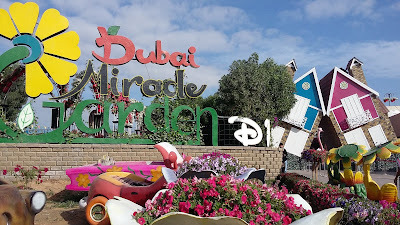 Hats off to Dubai for efficiently developing this oasis in the desert “through judicious re-use of waste water, through drip irrigation". 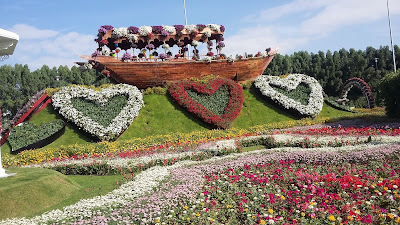 There are no adequate words to describe the aesthetically designed, visually enchanting creations and believe me, the pictures project only a fraction of the magnificence. 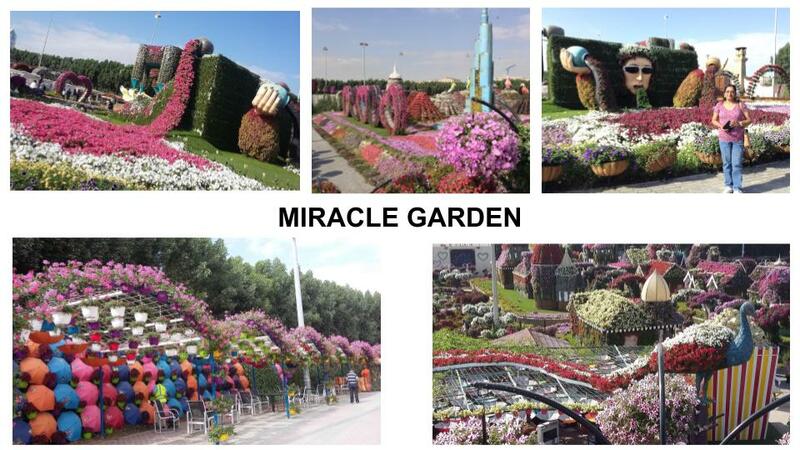 Don't conclude that it's just this garden that is aesthetically designed. As we drive around the excellent roads, our eyes linger on at the cool greenery along every side, not to mention green and orange and magenta flowers in bloom. 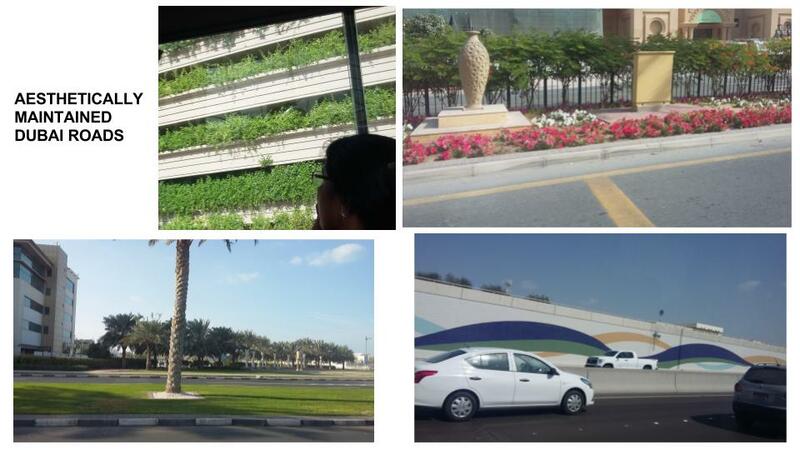 Guess we are privileged to have these visual treats welcome us during the 'Spring season' in Dubai. For the rest of the year, you can rest satisfied appreciating the attractive designs of metallic fences or tiled walls along the roads. 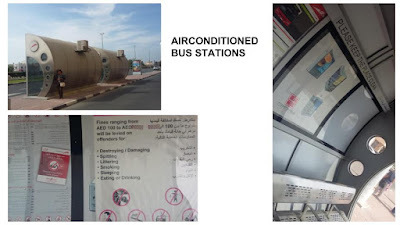 All metro stations look posh; even bus stations - they are small enclosures, with clean seats - providing air-conditioned comfort. But they cannot be unlawfully used - as per the strict warnings issued, defaulters will be fined heavily. But the point is we did not see anyone in the bus station! The roads are great, the cars are top-class, and driving is a pleasure. We bump into a lot of Indians wherever we go - the staff at hotels / restaurants, coach drivers, shop owners - many are from Kerala but everyone speaks fluent Hindi! 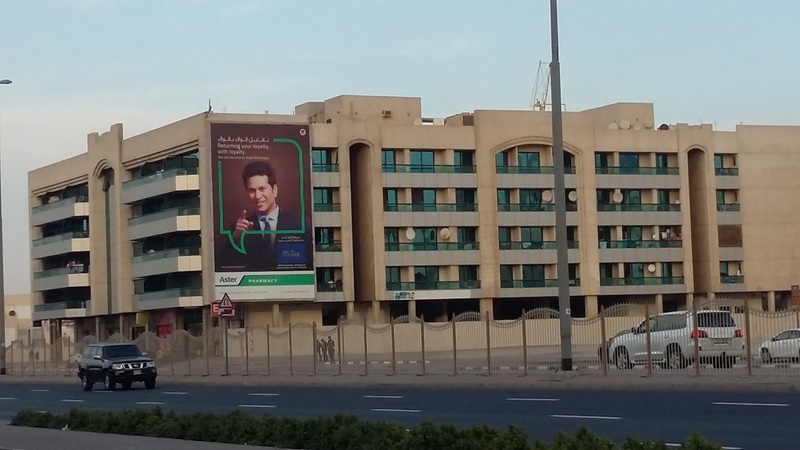 The hoardings on the roads are not too numerous but the ones we notice are those of the rulers of the Emirates and our own Sachin (Tendulkar), Sushmita (Sen) and famous Indian jewelry shops. We get a feeling that we are in India. 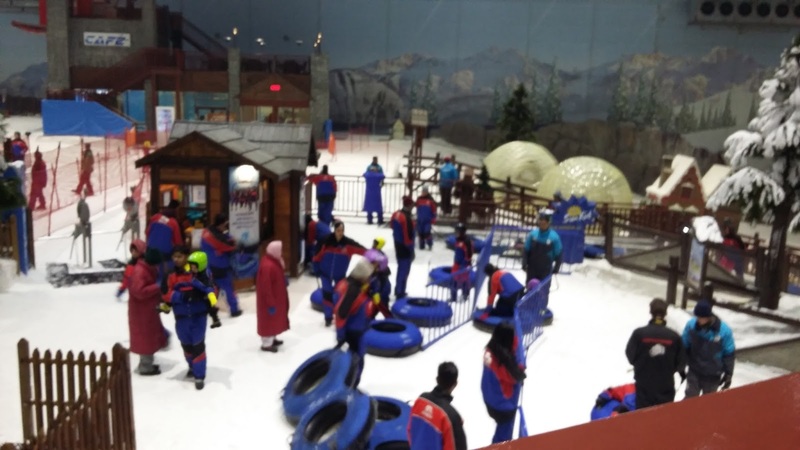 Dubai specializes in superlatives and the unexpected – with the world’s tallest building, tallest hotel and biggest natural flower garden, it includes such incongruous attractions as Ski Dubai. 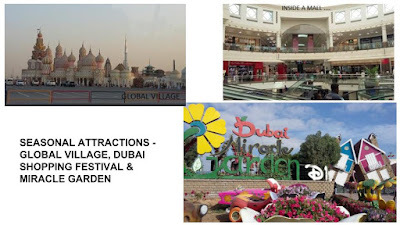 Dubai has wealth and more importantly it is well-utilized to maintain and upgrade the place and make it inviting for tourists, while adding continuously to the existing landmarks. 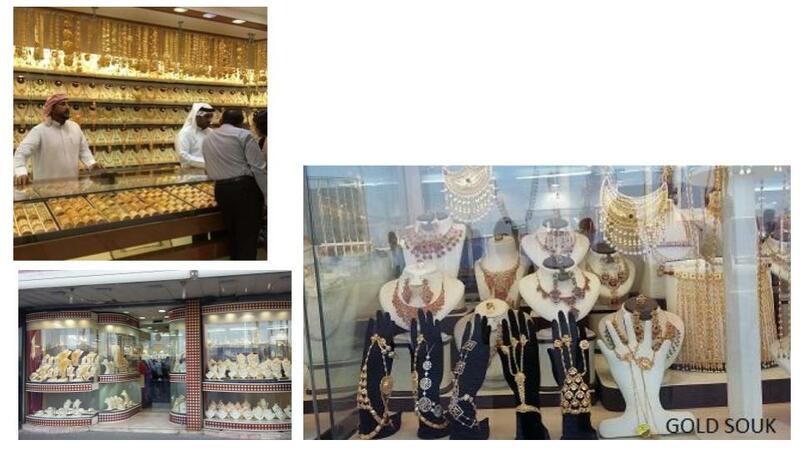 No wonder tourists flock to lap up dainty Dubai and crave for more! Our next destination was Abu Dhabi, the capital of the UAE.